Schmidt Hammer Lassen Architects won an invited competition to design the Maritime Knowledge Hub, a 6,400-square-metre facility dedicated to marine engineering research and development, survival training, business incubation, workspace, and events at the heart of the Wirral Waters redevelopment project in the United Kingdom’s Liverpool City Region. The Maritime Knowledge Hub will create a place for innovation, collaboration, learning, training, and business development in the maritime sectors, and will put Liverpool and the UK on the marine and architectural industries’ global stage. 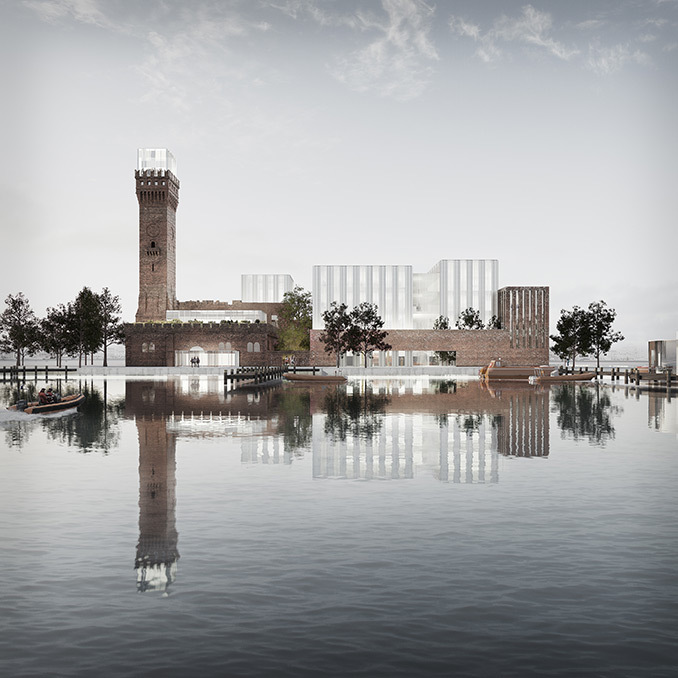 Peel Land and Property, in partnership with Liverpool John Moores University, Mersey Maritime, and Wirral Council, selected Schmidt Hammer Lassen, together with local firm Ellis Williams Architects, to design the £20 million Maritime Knowledge Hub. The firms will work with Parkinson Inc., the master planner for Wirral Waters. The Hub’s centrepiece is the historic Hydraulic Tower modelled after the Palazzo Vecchio in Florence, Italy, that now lies largely derelict, having been bombed in World War II. A second, new building, located adjacent to the tower, will comprise new office, incubation, teaching, and cultural space, and will house a tank for a state-of-the-art Offshore Survival Training Centre.